On 26th of April, TRANSLIT attended the BizExpo 2017 at Citywest Convention Centre in Saggart, Co. Dublin. It was an absolute delight to see over 1,000 entrepreneurial spirits buzzing around. This event gave us an opportunity to showcase our business to the greater Irish market, as well as gifting us a greater insight into digital marketing. Experts, such as Greg Fry, provided free advice on Google Adwords, Google Adsense, Google Display Networks, Facebook and LinkedIn. TRANSLIT plans to utilise this shared knowledge to expand our digital presence online for the future. The event began at 10:10am, with Alan Hennessy and his presentation on “How to Create and Build Customer Persona’s”. This was followed by Donna Kennedy’s “Confidence to Succeed in Business and Life”. These presentations continued until 4:30pm where Martin O’Neil closed with his presentation “Google Places & Local Search & Tips for SEO”. Between every presentation there was a twenty minute interval. These twenty minute intervals were great for networking, and allowed us to speak with a lot of driven entrepreneurs about why they were there and about their plans for the future. A highlight was Melanie Boylan of STOMP Social Media Training showcasing Canva, a handy application for graphic design. The workshop showed us how to use this inexpensive platform for business. Melanie demonstrated that you can create amazing visuals for various Social Media platforms, for newsletters, brochures and many more. The wealth of knowledge that poured from each and every presentation was extremely worthwhile, and interesting. Not to mention the engaging workshops that took place throughout the day. It was fantastic to see hundreds of passionate people pursuing their passions! 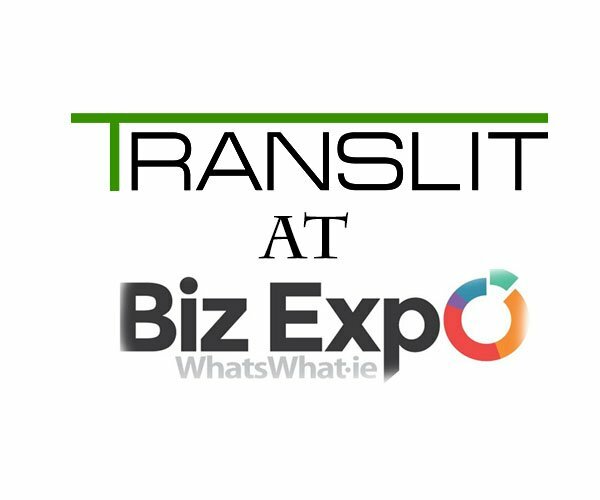 We at TRANSLIT would like to thank both BIzExpo 2017 for having us and everyone that came to our stall. We hope to see you all again soon.